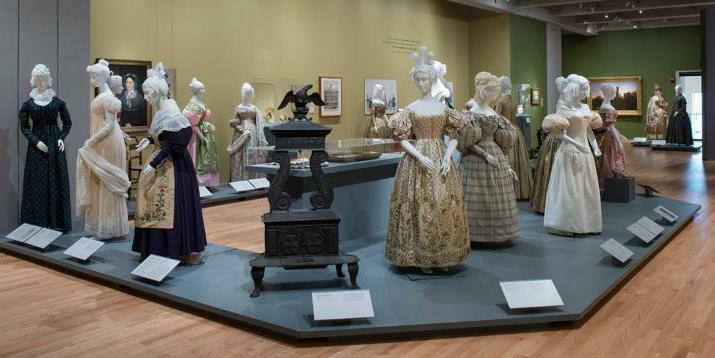 The latest exhibit by the Costume Institute is like a sumptuous banquet with many, many rich dishes, so many it’s difficult to choose. 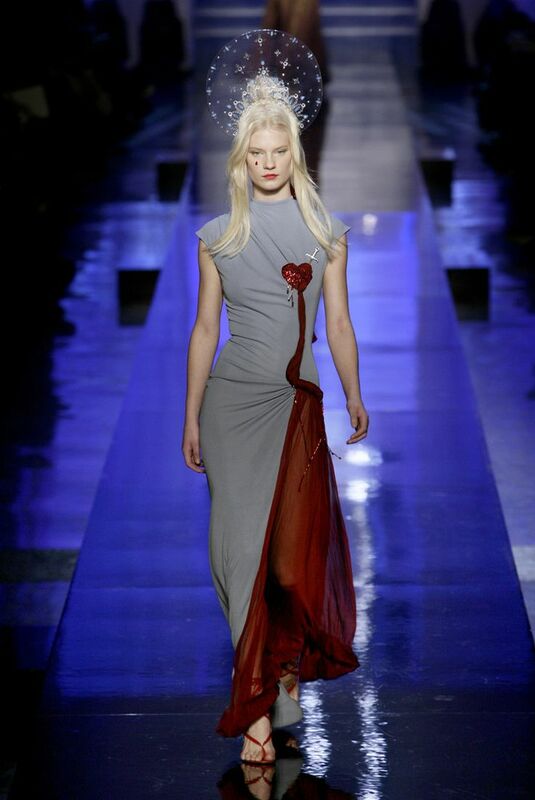 The purpose is to show the many, many ways Chinese themes have fascinated and inspired Western fashion. This is tricky territory. The imaginary East is a construction of the West and is under attack as a product of colonialism. 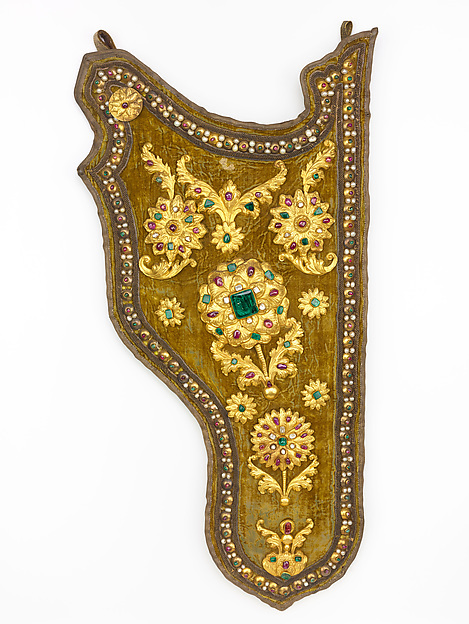 The exhibit acknowledges this objection voiced most notably by Edward Said, but states that the purpose of the exhibit is “driven less by the logic of politics than by that of fashion, which is typically more concerned with an aesthetic of surfaces rather than the specifics of cultural context.” The exhibit sprawls over 30,000 square feet and includes the 140 haute couture pieces from the 18th century to the present day displayed in the museum’s Chinese galleries and the Anna Wintour Costume Center downstairs. The experience (and it can only be called an “experience”) is amplified by the art direction of filmmaker Wei-Kar Wei, who has selected a range of films that have dramatized China in the Western mind. They range from the “Broken Blossoms,” a 1919 movie about opium smoking, to “The World of Susie Wong,” a 1950s romance about prostitution and redemption. In the background on the Chinese galleries is the art that inspired this fantasy. It’s a lot to take in. Curator Andrew Bolton has described the arrangement of the exhibit as “film stills.” Label copy is minimal. This is to encourage one to absorb the total experience in each gallery, not focus on small details. There is a great deal of Yves St Laurent, who staged a famous China show in the 1970s and devised the signature perfume Opium. John Galliano seems to appear everywhere too, most notably, in the gallery titled “Moon in the Water” where his fantastical gowns seem to float above a small “lake.” But, there are many other treats to look for—a gorgeous red velvet jumpsuit by Paul Poiret covered with a shawl embroidered with alternating rows of embroidery and fringe, a gown by Alexander McQueen inspired by Chinese painted wallpaper displayed across from elegant gowns from the 18th Century with intricate painted Chinese motifs, and exquisite robe a la franchise with the strip after strip of Chinese florals accented with gold thread, and a 1924 robe de style by Jeanne Lanvin. The possibilities are endless. 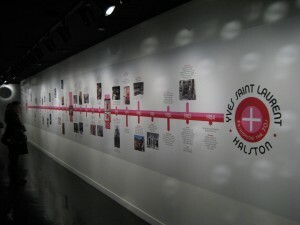 The themes in each gallery could be the nucleus of a smaller exhibit. 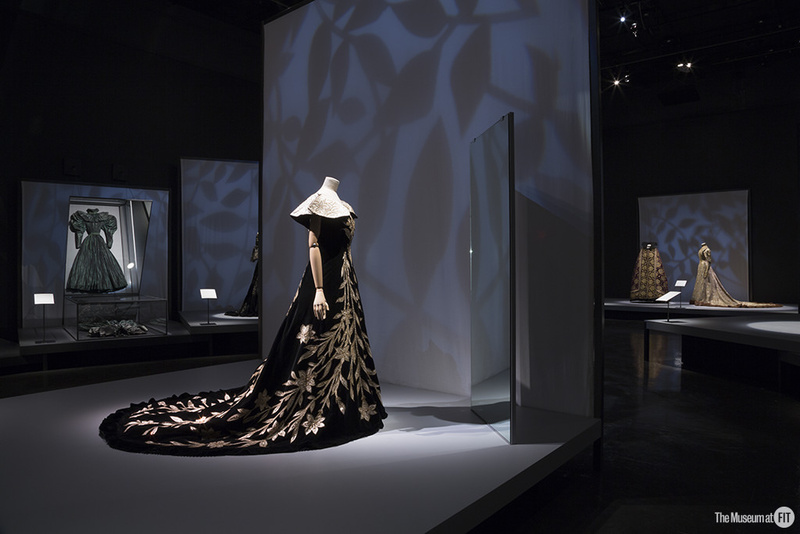 The Asian galleries upstairs create a dreamlike background for the parade of gowns, perfume bottles, and, even a tiny, delicate Philip Tracey headpiece of a Chinese cityscape. Transition comes in the hallways. One is a tribute to Chinese-American Film star Anna May Wong who was stereotyped as the villainous “Dragon Lady” and the docile “Lotus Flower” till she quit Hollywood and decamped to Paris. According to Bolton, Wong’s screen persona fed the fantasies of Western viewers and cemented their visions of the inscrutable East. 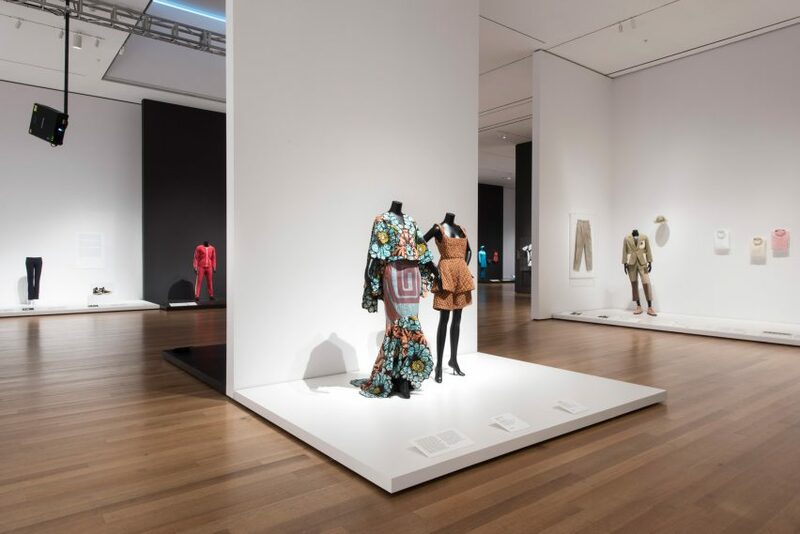 “Dreamy” is not what one would call the themes of the other transitional gallery, which deals with the influence of Communist China and the utilitarian “Mao Suit,” a drab unisex garment that still inspired Western fashion. “The Red Detachment of Women,” a ballet from the Cultural Revolution plays high on the wall. The gallery also features Vivienne Tam’s famous suits and dresses printed with multiple images of Mao as interpreted by Andy Warhol. Downstairs in the Anna Wintour Costume galleries the pace seems to quicken, partly due to the enormous projections of Bertolucci’s “The Last Emperor” on two central walls. 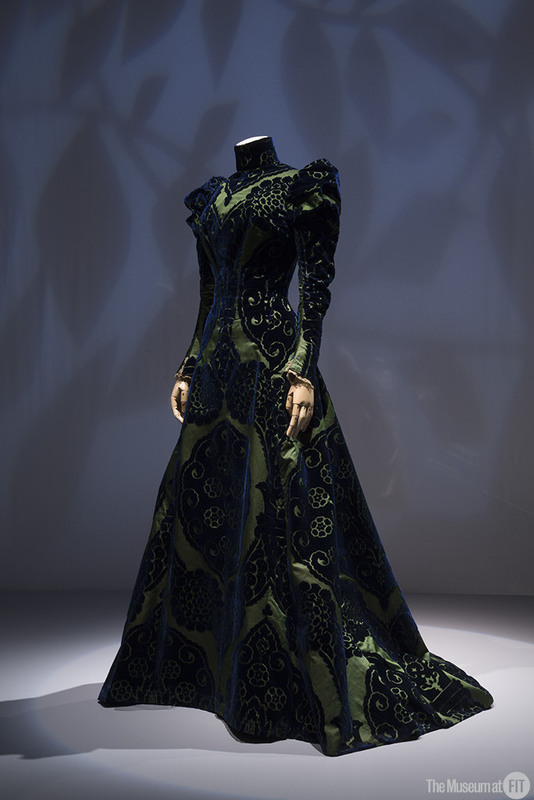 One gallery is dedicated to the cheongsam or qipao, a development of the 1930s, which evolved from the loose robes of the Manchu court to the form-fitting gown of the film stars of Shanghai. 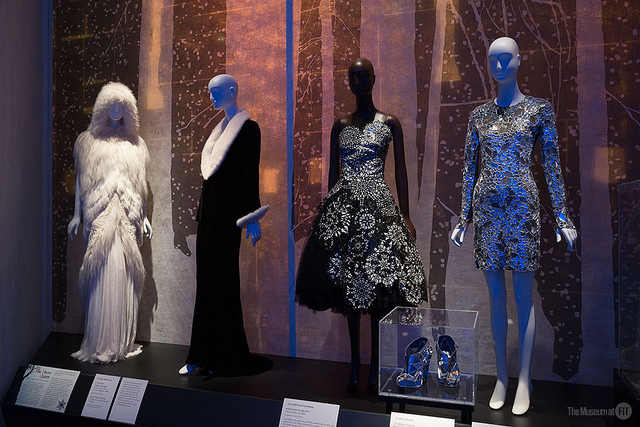 They are displayed opposite the fashions they inspired. I felt this gallery was too full and crowded. It was hard to see the pieces and movement in that space was limited by the fact that there was a film playing on the back wall. People tended to stand and watch the film, so I had to maneuver around them to get a closer view of the garments on display. I should add that I did not have this feeling in the rest of the exhibit. Even though there were plenty of people in the galleries upstairs, I did not feel like I had to strain to see the pieces. 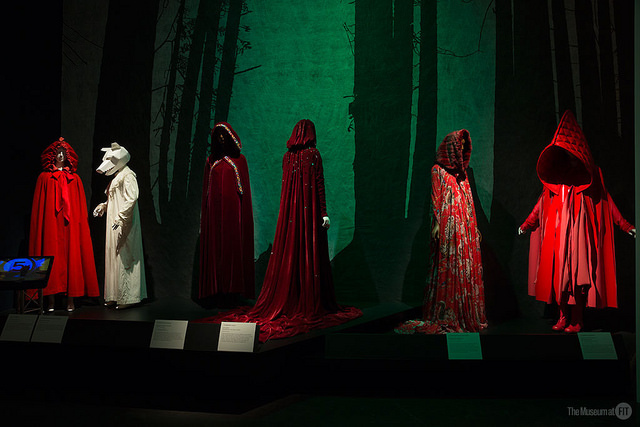 Out in larger space downstairs, those Manchu robes are displayed, each with a haute couture gown. The embroidery on the Manchu robes is fabulous. I wished I could get closer to see it. The Western couture glitters. It occurred to me that sequins are the gold thread of our time. The music in this gallery is thundering and relentless. Here some more detail would have been helpful. The symbols on the Chinese robes have great meaning even down to the number of claws on a dragon. 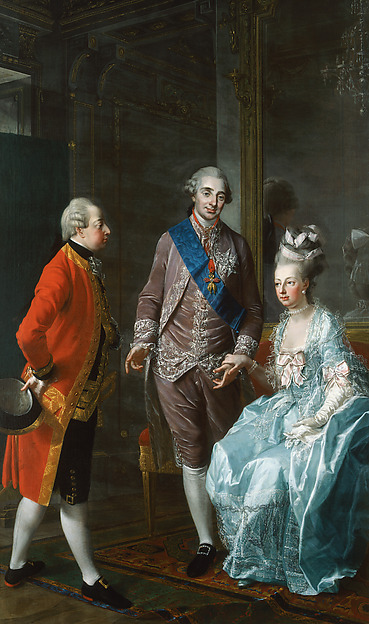 It would have helped understand the tremendous transition over the centuries from court robes to high-end fashion if there had been a bit more explanation here. Special mention must be made of the gorgeous headpieces by milliner extraordinaire Stephen Jones. They are elegant, often whimsical, and witty. They always add the perfect grace not to each mannequin. I had two wishes as I went through this massive exhibit. The Museum at FIT did an exhibit on “China Chic” in 1999. I found myself wondering how it would compare with this one. 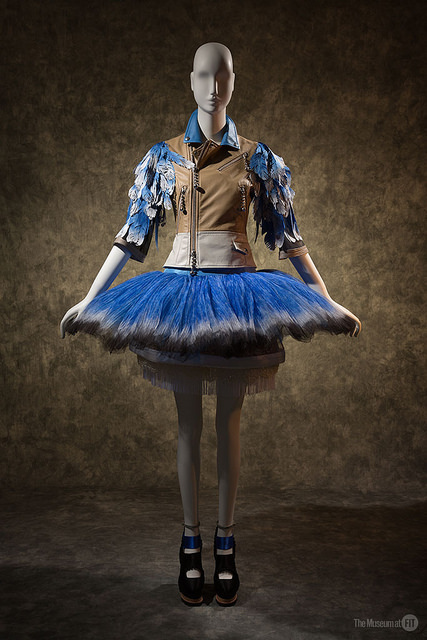 Also, the Met did a fine exhibit earlier this year on the art of the Plains Indians, which contained many garments that showed how the Native American and European cultures influenced each other. 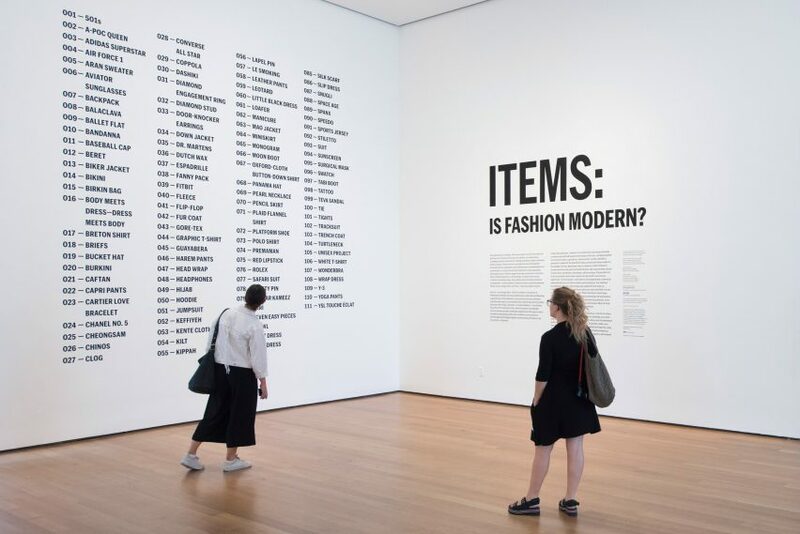 Since this is another culture that is often appropriated by fashion, it would have been wonderful to have them both on view at the same time. 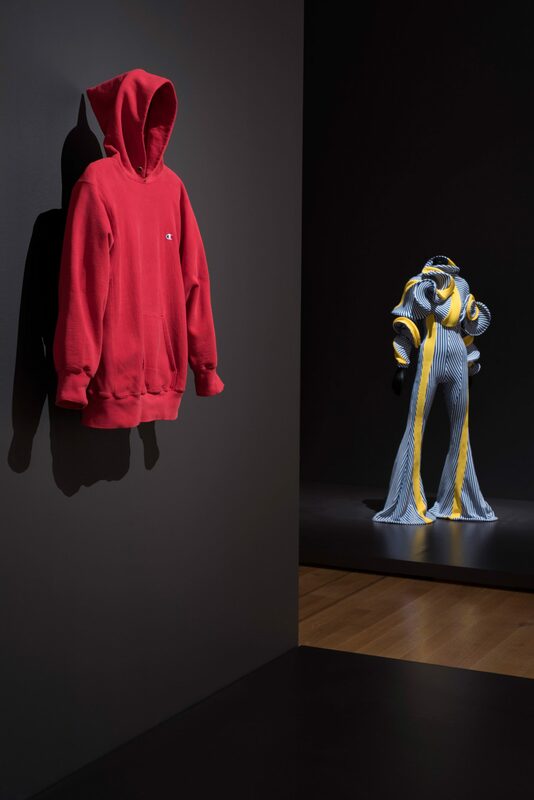 Yet again, the fabulous Nadine Stewart is offering us a wonderful review of a current exhibition (at the Museum@FIT, on view through April 18, 2015 (if you are headed to NYC). Be sure to check out Nadine’s photos at the bottom of the post as well! “The Unlovable Decade.” That was what New York Times called the 1970s recently. That certainly the way I’ve felt about the period. I have too many memories of avocado kitchens, orange shag carpeting, huge macramé plant hangers, garish polyester double knits leisure suits, and “conversation pits” upholstered in brown velour. But, the latest exhibit at the Museum @ FIT has helped me to see the period in though a different lens. I may never really like the decade, but I can now see it more objectively. Yves Saint Laurent + Halston does not attempt to be a retrospective of either designer or a definitive survey of the fashion of the 1970s. It uses the rich resources of the Museum @ FIT’s collection only, but that is enough to show how the two men’s careers paralleled each other. 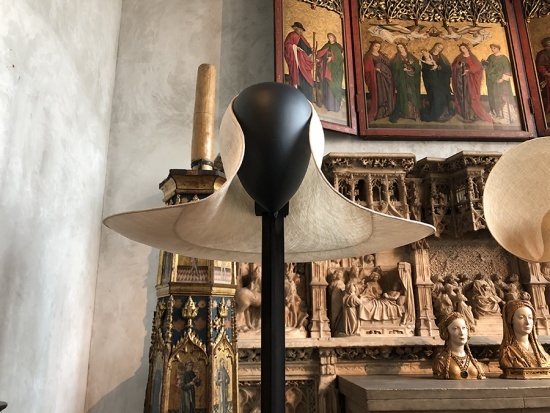 The curators in this well edited show confine themselves to a comparison of the careers of two designers who dominated the decade and come to some interesting conclusions. The first thing one sees upon entering the gallery is a huge timeline between flashing mirrored disco balls. In the clear graphic it is easy to compare the trajectory of the two careers from the early 1950s when both careers began to the mid 1980s when Halston went off the fashion radar and Saint Laurent was no longer a young innovator, but a member of the Parisian establishment. One notable milestone is 1966, four years before the 1970s began, when YSL founded his first Rive Gauche boutique in Paris. Rive Gauche was important to Saint Laurent. 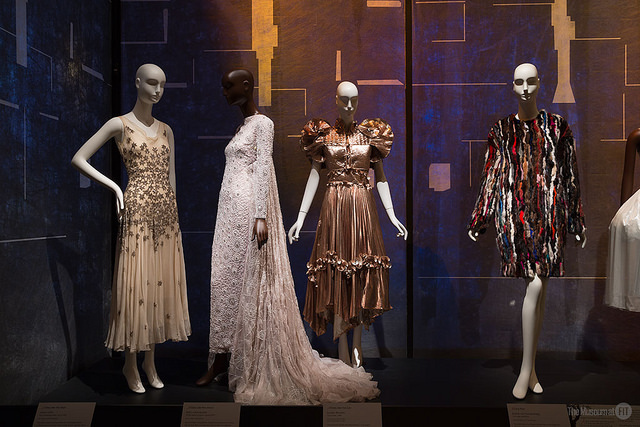 This exhibit brings out the fact that the ready-to-wear line was the designer’s incubator for styles that later appeared in his haute couture line—a fact that has been forgotten over time. 1973 is another important date since that was the year of “The Battle of Versailles.” The Americans were declared the winners of this competition based on their simple breezy presentation that made the overly long, tedious French production seem tired and dated. 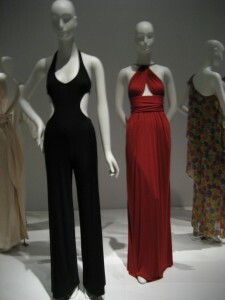 Halston, already a well-known figure, rocketed to fame after this show. In 1975, Esquire magazine declared he has poised to “take over the world.” At this point in the timeline, it’s a good idea to enter the main galley to see how the garments compare. Halson’s approach to menswear was less literal. 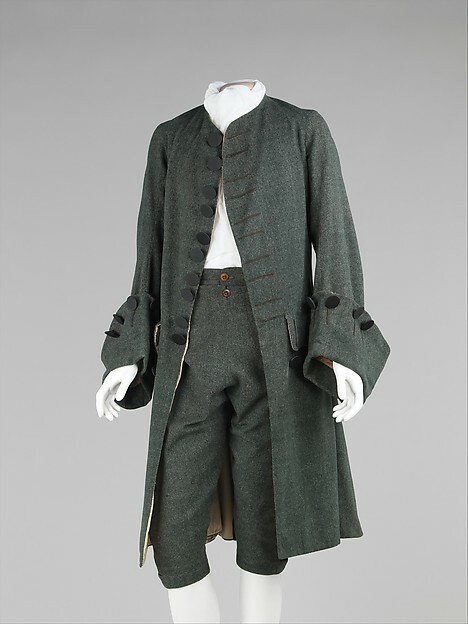 He incorporated elements of men’s clothing into his line. The famous Ultrasuede shirtdress is fine example. 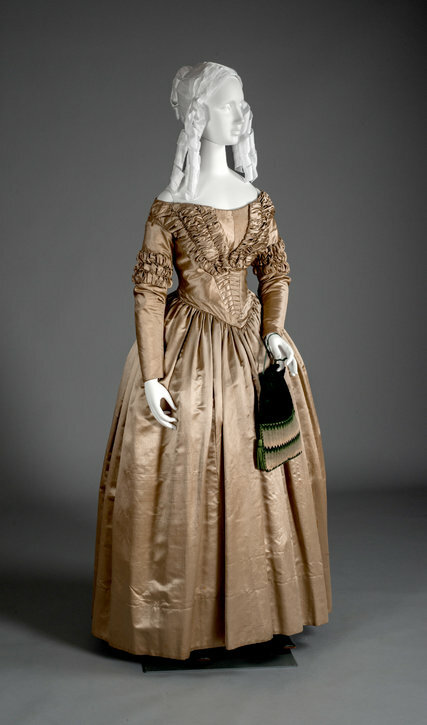 It was wildly popular, adopted by women of every age in the wide range of colors. I do remember attending a cocktail party in the early 1970s where it seemed every woman who could afford it had one on. Ethnic and vintage-inspired fashions were strong in the 1960s. The trend continued in the 1970s, with designers like Giorgio Sant Angelo mining every possible ethnic influence to produce a high end “hippy chic.” Saint Laurent took a more considered approach rooted in French tradition. 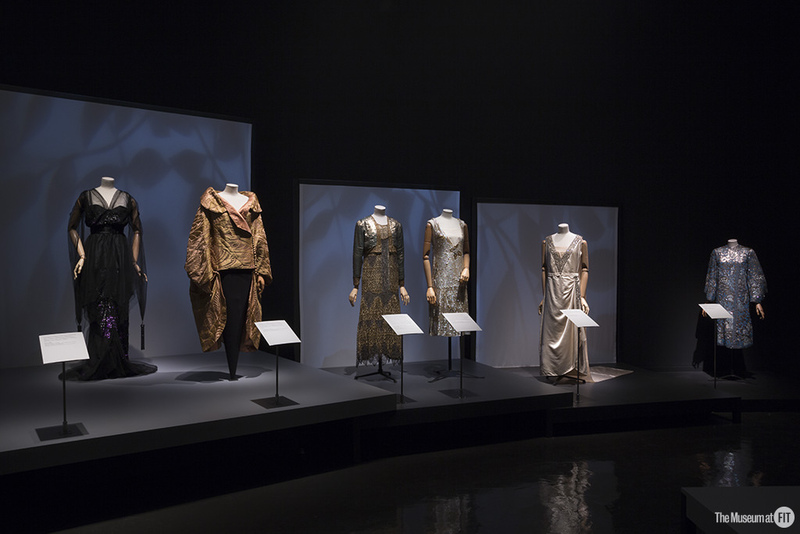 His most famous collections were the “Ballet Russes” and “Opium” collections of the mid-1970s, which were dripping with Orientalist themes, but also on display are dresses from Rive Gauche, which show how he played with these themes for years. 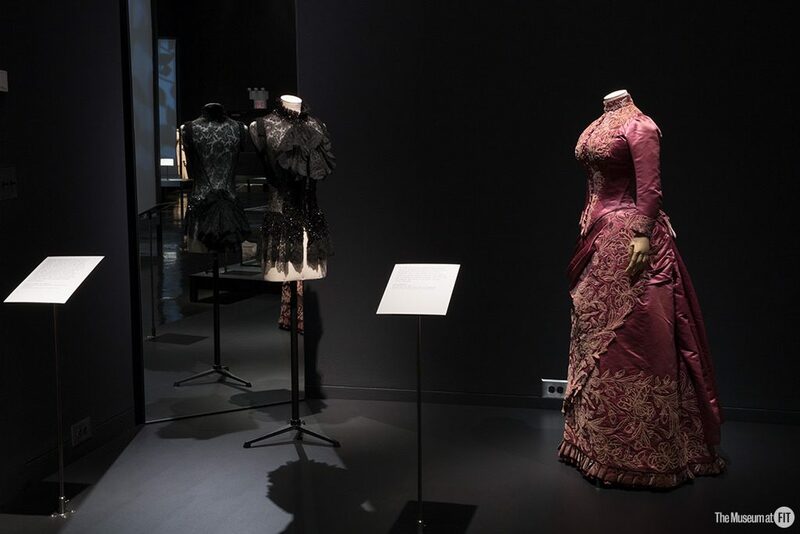 Also on view are pieces that echo Christian Dior and Chanel with influences that range from a medieval lace front velvet, a Belle Époque-inspired gown in shimmering purple and red with huge gigot sleeves, and sweater-skirt ensembles embellished with fur collars and cuffs. Halston historicized more sparingly. 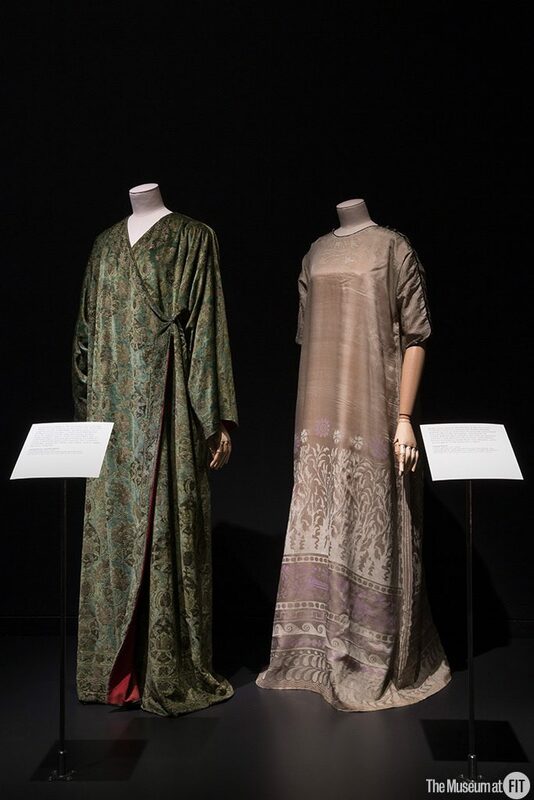 He used eliminated the decorative elements of non-Western dress in favor of minimal garments that were inspired by the simple draping of ethnic clothing like the caftan and sarong. Another important point. Both designers had very similar ideas in the early 1970s; so similar it can be difficult to tell their work apart. 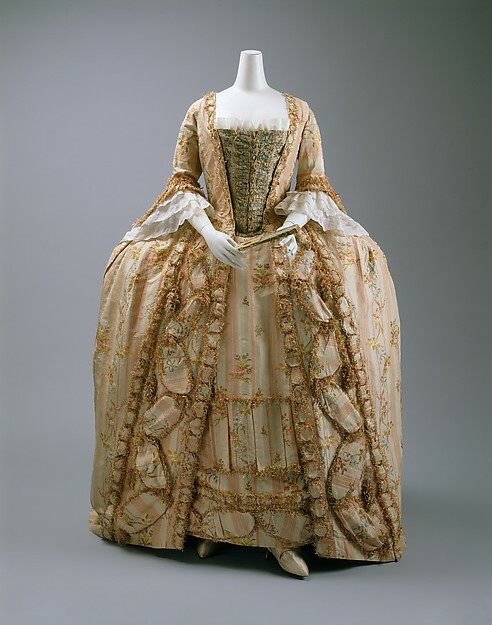 A pleasure of this exhibit is circular platforms on which pairs of garments are mounted. It’s fascinating to see how much alike they can be, especially the flowing gowns influenced by the Art Deco of the interwar years. 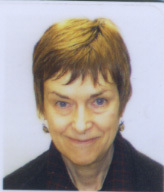 Curator Patricia Mears has a good eye for important construction techniques and points out that Halston was an innovator in fine couture construction. 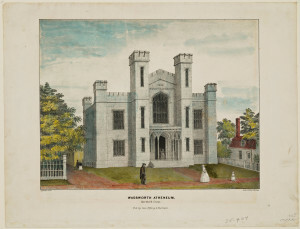 He eliminated the interior shaping and linings. 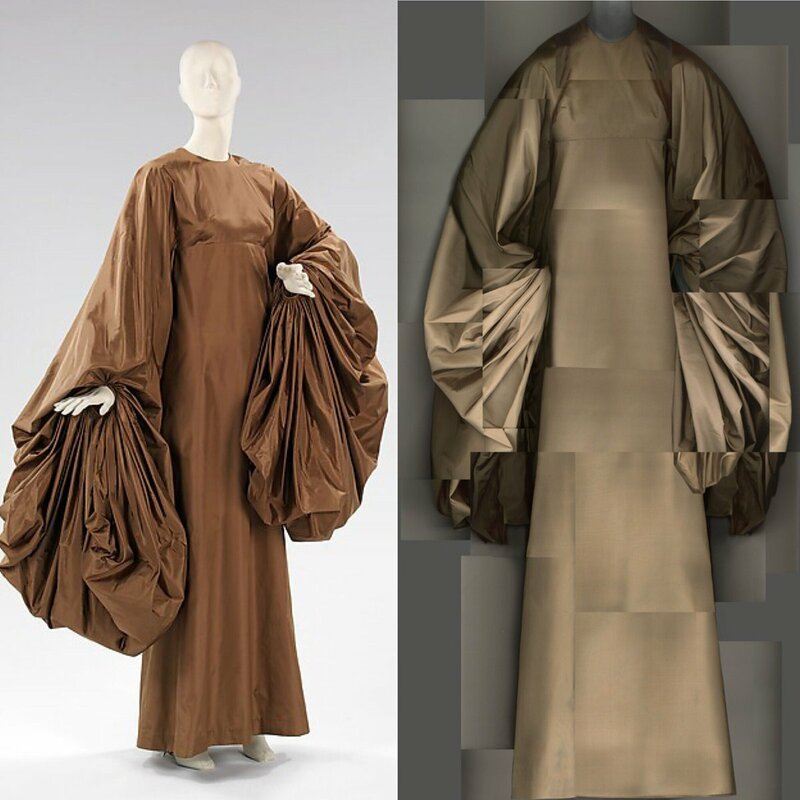 Inspired by the work of Madeline Vionnet and Claire McCardell, he also eliminated darts and waistbands. 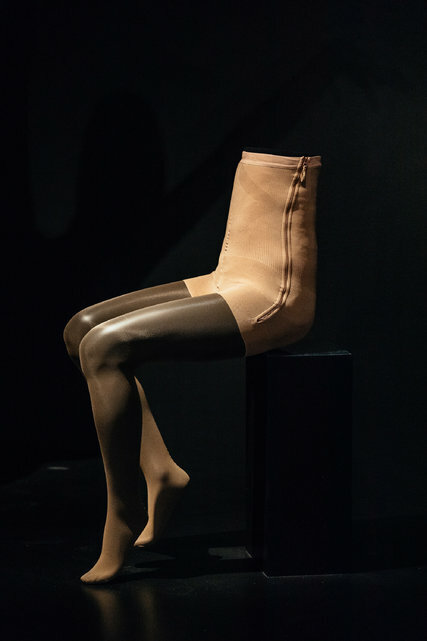 Saint Laurent, in contrast, continued to use interior construction, a remnant of his years of training in Dior’s atelier. His use of flowing materials, like Halson. gives his garments the sleekness of the Art Deco period. After a walk through the gallery, it’s a good idea to go back to the timeline, which shows where the two men’s careers diverged drastically. In September 1977, both designers were featured on the cover of W magazine. Both were on top of their game with signature perfumes that were adding millions to their bottom line, fabulous apartments that were featured in shelter magazines, and hundreds of lucrative licensing agreements. It seemed they would go on to challenge each other into the next decade and beyond. But fashion is fickle. In 1982, Halston signed a multi-million deal with JC Penney to produce a lower price line called “Halston III.” This probably seemed like a coup for his business. JC Penney, after all, was the first American company to pick up Mary Quant in the 1960s. For Halston, the deal was a disaster. High-end department stores dropped his clothes since they lost their cachet. Saint Laurent continued to hold his place as a leader of the fashion establishment in Paris. 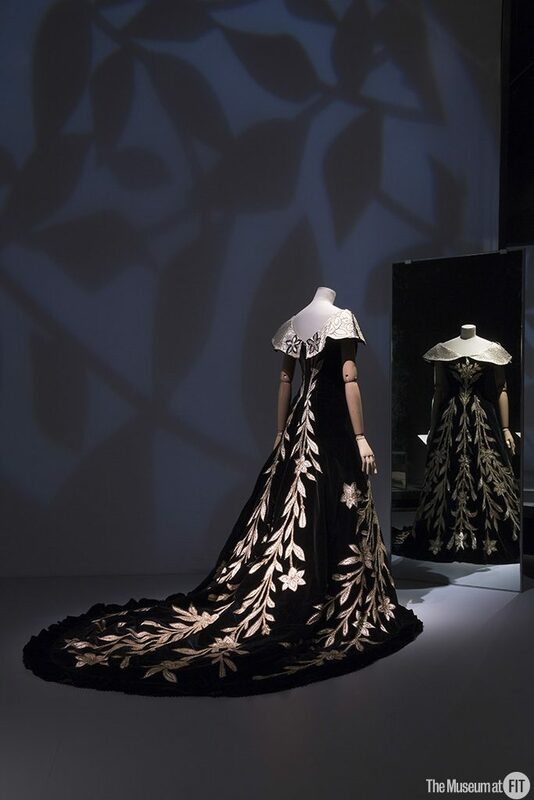 He was honored with a career retrospective at the Metropolitan Museum of Art in 1983 curated by the former editor-in-chief of Vogue Diana Vreeland. By 1984, Halston had lost control of his company and could no longer design under his own name. The era of joint creativity was over. This exhibit was extremely satisfying on many levels. 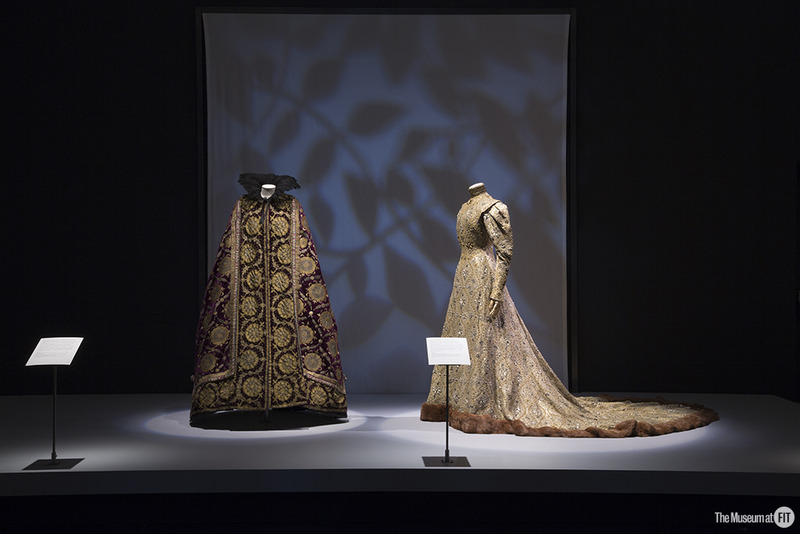 It offered fresh insights into the work of two important designers and clarified why they defined their period of fashion history. By doing so, the curators allowed us to view the 1970s with fresh eyes. I may never get over those double knit leisure suits, but now, I’ll never forget the glorious work of these designers I saw on display. 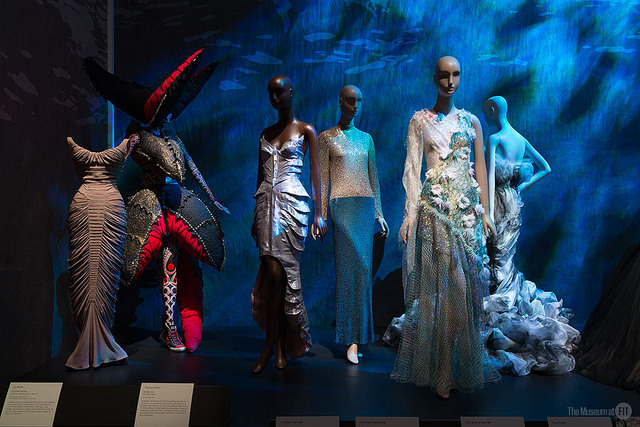 This exhibit is one to visit more than once. A personal opinion here. Halston got his start as a milliner, a topic the exhibit barely mentions. I feel this training enabled him to think in three dimensions—something a milliner must always do since a hat will be viewed from all angles. 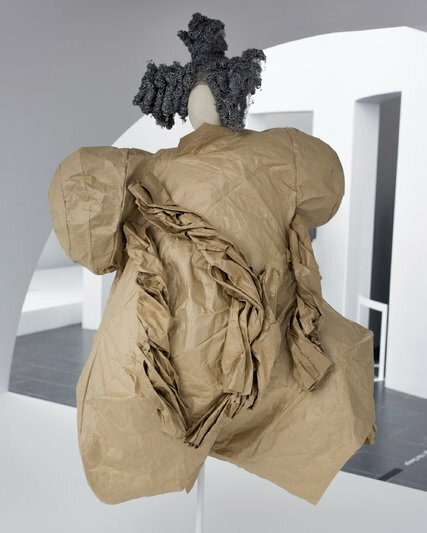 He was especially known for his ability to drape a turban, work that requires a fluid ability to work with material without an underlying structure. 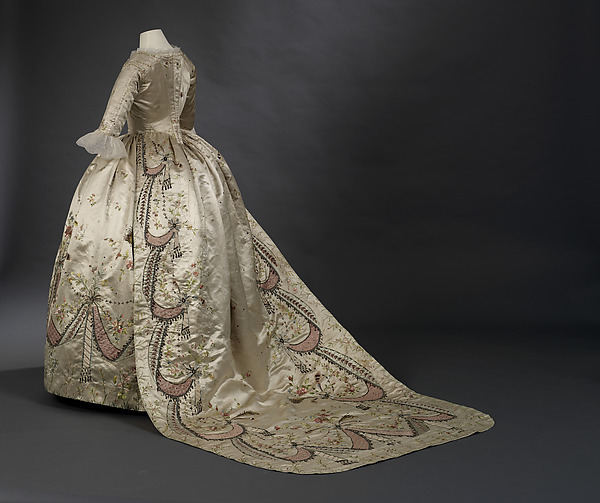 I think this contributed to his design of gowns that flowed and were wrapped and tied around the body, which became his signature style.